Cornwall Community Foundation (CCF) Business Club has awarded two grants totalling £6,000 to St Keverne Methodist Church for community projects. 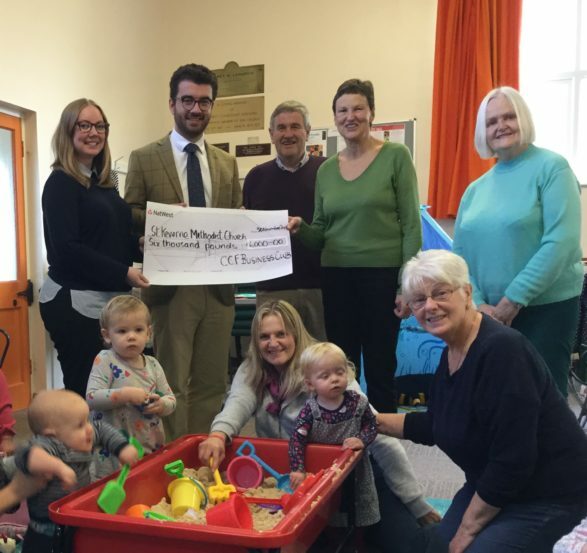 James Sculthorp-Wright and Jayne Robinson of Atkins Ferrie Wealth Management (AFWM) visited the project on behalf of the Business Club to present the cheque and see the Little Blessings parent and toddler group in action. The CCF Business Club is a group of businesses who all make an annual contribution to CCF that is pooled and awarded to support local community projects in Cornwall and the Isles of Scilly. At its latest grant panel meeting in October, members awarded £17,500 to eight community groups across Cornwall, including Illogan Old School Community Centre, Pipers Pool Methodist Church, Tintagel PRFA, Devon & Cornwall Food Action, Camelford and District Age Concern and Lelant Village Hall.